Thanks to the power of cinema, Mary Shelley’s Frankenstein, the tale of a scientist’s hubris, has become a prominent element in American popular culture. When Hollywood’s first full-length screen adaptation of Frankenstein; or the Modern Prometheus appeared in 1931, it was an instant sensation. In making the movie, however, director James Whale had taken considerable liberties with Shelley’s novel. In the decades that followed, Hollywood produced a number of spin-offs and variations of the Frankenstein story. Some were serious attempts at horror, others were campy grade B movies, and some were even comedies. 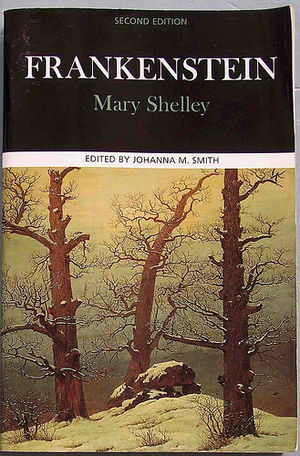 Some were good, many were awful, and none did justice to Mary Shelley’s work. Then a decade ago, in Mary Shelley’s Frankenstein, director Kenneth Branagh created a film that would prove to be more faithful to the spirit and words of Mary Shelley’s prose. For example, whereas Boris Karloff’s “creature” in the 1931 movie was a grunting brute and a far cry from Shelley’s character, Robert DeNiro’s character in the Branagh version is more human than any of the other characters, and hence, his death is that much more tragic. Despite artistic differences, all of the Frankenstein movies — the first in 1931 and the last in 1994 — share some common cinematic devices. One of those is the tale’s technological premise. Most who have seen the original movie can recall the scene when Dr. Frankenstein first perceives movement in the creature he stitched together from stolen cadaver parts. His cry, “It’s alive!” illustrates the moment when the intoxication of god-like success reveals its other face — madness. This archetypal scene reappears in some form in all of the movies. Perhaps even more important is the portrayal of electricity as the secret of life. Electrical machinery figures prominently in the set design of all of the Frankenstein movies. By means of electrical technology, Dr. Frankenstein harnesses nature’s fury — an electrical storm — to resurrect the dead. Yet historically, before the 1931 movie was made, popular consciousness generally associated electricity with death. People knew that in Greek mythology, for example, Zeus hurled thunderbolts to destroy his enemies, not revive them. In the late 19th century, when electric power was being introduced into the urban landscape, there was widespread fear of this unknown force. Confronted by a new technology, concerned citizens saw electric power lines as a health danger. And by 1931, the electric chair had replaced the gallows as the symbol of retribution and certain death. So how did the theme of electricity as the spark of life enter Hollywood? This cinematic theme's roots can be traced to the late 18th century and the work of Luigi Galvani. Born in 1737, Galvani studied anatomy at the University of Bologna, considered by many to be the world’s oldest higher learning institution. Galvani received a doctorate for research on the human skeleton when he was 25, and by 36 had risen to the senior rank of professor of anatomy and surgery at the university. 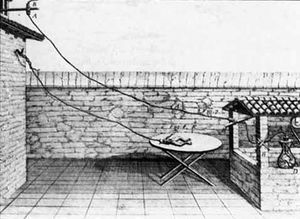 One day in 1786, Galvani was researching a dissected frog in his laboratory as an electrical storm raged outside. To his surprise, the frog’s leg muscle twitched whenever his scissors touched a nerve. This made him wonder if, through the air, the lightning could have exerted some subtle influence on the frog’s nerves and muscles. That same year, during the course of another experiment, one of Galvani’s assistants casually touched the lumbar nerve of a dissected frog with a scalpel. The frog’s legs kicked. 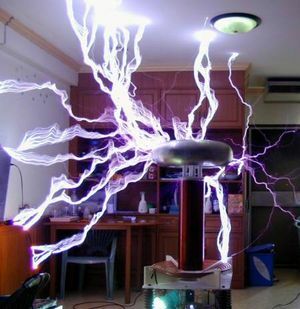 On this occasion there was no electric storm, but Galvani’s wife pointed out that an electrostatic generator was turned on in another part of the laboratory. Like the lightning, could the electrostatic generator have affected the frog through the air? Intrigued by these coincidences, Galvani embarked on a new series of experiments. He found no relationship between these external forces and the dead frogs’ leg movement, but he came to an astounding conclusion: electrical energy was intrinsic to biological matter. He argued that the metal scissors and scalpel served as conductors that moved electricity from the nerve to the muscle, the way static electricity discharged when the terminals of a Leyden jar were connected. 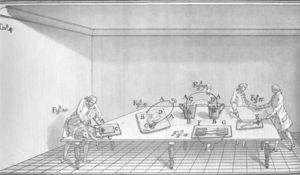 Realizing the momentous import of any conclusion that electricity was the “vital force” of life, Galvani was cautious about releasing his results without conducting more research. In 1791, he published De viribus electricitatis in motu musculari commentarius, announcing to the world that electricity was an innate force of life. Europe's intellectuals heralded Galvani’s work as a great achievement. They were abuzz with excitement at his theory on the relationship of electricity to life. And while Alessandro Volta, Galvani's contemporary and a physics professor at the University of Pavia, believed that Galvani’s work “contain[ed] one of the most beautiful and most surprising discoveries,” his own experimentation led him to a different interpretation of Galvani’s experiments. For Volta, the electrical phenomenon that Galvani observed arose from the action of dissimilar metals, not an internal property of life. Galvani countered with another experiment. Partisans rallied around Galvani and Volta and a great debate ensued along clear demarcations: the animalists versus the metallists; the physicists versus the physiologists; University of Bologna versus University of Pavia; and the city of Bologna versus the city of Pavia. Galvani was a humble man and the debate never turned into a rancorous display of petty jealousy. In fact, the search for truth, not pride, animated the debate. In the end, Volta’s view prevailed and opened the science and technology of electrolytic action and batteries. Out of great respect for Galvani, Volta coined the term “Galvanic action.” And from a 21st century perspective, Galvani was not completely wrong; just think of the electrical activity of the heart and brain. In Shelley’s novel, Victor Frankenstein alludes to lightning and Galvanism as the basis for resurrecting a lifeless cadaver. Although Volta’s ideas had supplanted Galvani’s theory of animal electricity within the scientific community, the notion of electricity and reanimation still lingered in the air when Mary Shelley penned her novel. Mary Shelley herself mentioned philosophical discussions between her husband, the poet Percy Shelley, and Lord Byron in 1816 on Luigi Galvani’s experiments and how Galvanism suggested the possibility of reanimating the dead. These discussions stimulated her to explore, in fiction, the moral and personal responsibilities and the dilemmas of scientific advance. Rather than dabble in science, Mary Shelley wisely leaves it to the reader to imagine the laboratory in which Frankenstein brings his creature to life. In fact, only two sentences in the entire book allude to lightning and the Galvanism theory. Shelley offered nothing to the set designers who needed to create visual feel for the laboratory and the act of creation. So where did the 1931 Frankenstein movie find its inspiration for the spectacular electrical displays that accompanied the creature’s creation and became the de facto design standard for subsequent movies? In fact, though Galvani may have been in the shadows when Shelley wrote her novel, it was Nikola Tesla’s high-voltage showmanship that inspired the set of the 1931 movie. The high-voltage special effects were the brainchild of Kenneth Strickfadden and John Foster, neither of whom was even mentioned in the film’s credits. The moving electrical arcs of Jacob’s Ladder, the lightning effects from Tesla coils, and high-voltage knife switches and meters found in power stations became the de facto special effects standard in all Frankenstein movies. 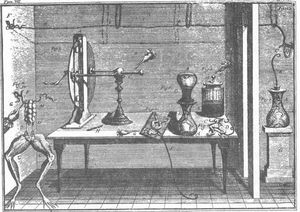 A look at Galvani’s laboratory, with its electrostatic generators and scattered animal body parts, could have provided inspiration for a set, but no one in the movie ever looked at Galvani’s work. Tesla was more immediate. He had achieved widespread fame and was the talk of the town. Images of him sitting calmly in a room filled with 40-foot electrical sparks were made for Hollywood. When Branagh wanted to do a more faithful representation of Shelley’s work, his team must have gone back and looked at Galvani’s work. A scene in Branagh’s movie depicts several electrodes attached to a dissected frog’s leg. At one point, the frog’s leg kicks and a satisfied Victor Frankenstein whispers, “Yes, that’s it. That’s the combination.” At this point, Frankenstein is ready to conquer death with the spark of life. The next time one watches a Frankenstein movie, think of Luigi Galvani and the joy he must have felt when he thought that he had discovered the secret of life. But unlike Frankenstein, whose hubris brought tragedy, Galvani was a modest man whose theories, albeit flawed, prompted Volta’s discovery of the battery and presaged advances in medical science. This page was last edited on 15 September 2015, at 17:02.